IN 1957 BIRACIAL ACTRESS Dorothy Dandridge starred in a romantic role opposite white actor John Justin in the film, Island In The Sun. Although physically the couple did little more than embrace on camera, and didn’t even kiss, the film caused a storm of protest across the country, as it was Hollywood’s first ever depiction of an interracial relationship. Harry Belafonte and Joan Fontaine, who also starred in the movie, formed another mixed race couple in the drama set on a fictitious Caribbean island during the era of British colonial rule. Key scenes of intimacy between both sets of black and white actors — which included kissing — were cut from the final edit, while Fontaine and Belafonte received hate mail during filming. 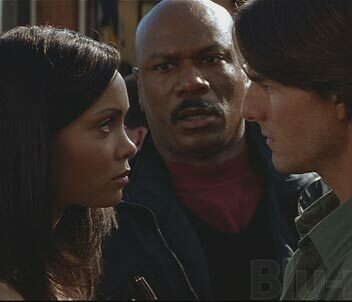 Less than 50 years later, by contrast, there was hardly any reaction when Tom Cruise kissed Thandie Newton in Mission Impossible II (2000). Despite this, the light-skinned biracial actress who played Cruise’s love interest — jewel thief Nyah Nordoff-Hall in the $100m blockbuster — is one of only a handful of women of color to have starred in a Hollywood interracial romance since 1957, in an industry still stratified by race. The infrequency of onscreen interracial relationships seems not only strange, but increasingly old fashioned in a country that demographically is increasingly mixed, and has a president who is biracial. But in reality, when interracial movie couplings do occur, as in the Mission Impossible movie series, the rules as to the type of black women actors cast are very strict, and have remained unchanged for a century. Candidates have to be lighter-skinned and straighter haired, thereby presenting less of an aesthetic contrast for close-ups with their white co-stars. The traditional thinking is that film-goers are more willing to accept a black love interest who “blends” — who tonally looks more European than African, or, as it has been put many times, “looks like a white woman with a suntan.” Biracial actresses such as Paula Patton, Thandie Newton or Halle Berry are often held up as examples of Hollywood's bias, despite the fact that it is the industry, and not the actresses themselves, who should be the subject of scrutiny. At the other end of the aesthetic spectrum, the movie industry's bias for light-skinned biracial celebrity actresses leaves talent such as Oscar-winner Lupita Nyong'o — who has dark skin and short Afro hair — out of running for these roles. The Bollywood film industry has the same issue, with light-skinned Indian actresses being promoted ahead of their darker counterparts. Will there ever be a time when things will be fairer in film? BIAS FOR BIRACIAL CELEBRITIES : African American star Paula Patton (left) and British actress Thandie Newton have both starred in the 'Mission Impossible' movie series. When casting black leads, Hollywood has traditionally expressed a preference for light-skinned women actresses, especially when appearing in romantic roles opposite white co-stars. HOLLYWOOD BLACK: Biracial actresses Thandie Newton and Paula Patton star in the 'Mission Impossible' film series. The movie industry has always shown a preference for casting light-skinned black women in high profile roles, as opposed to their darker-skinned counterparts. The number of people worldwide who Google the term, “Light-skinned black women actors”, each month. The number of people worldwide who Google the phrases “biracial celebrities”, and “mixed race celebrities each month. *All figures for “Biracial Celebrities & Light-Skinned Black Women Actors - The Stats”, supplied by Google. Figures include global totals for laptop and desktop computers and mobile devices. Thandie Newton's Battle Against Racism. What Do 100,000 Google About Paula Patton?